Looking for an end of the year gift for teachers ? A gift certificate from the market is something anyone can appreciate . Special Guests – The Master Gardeners They are here to try and help you solve your garden problems. Hector’s Honey is located less than three miles from the market . You can’t get more local and seasonal. 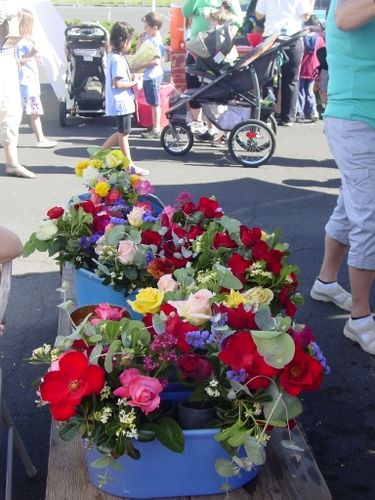 TGIW…that’s right Thank goodness it’s Wednesday..that’s what people say after they have been to the Wednesday market at Luther Burbank Center for the Arts. 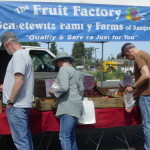 The Sebastopol Berry Farm returns to the Wednesday market. They’ve added strawberries to their organic berry crops. Cherries are the manager’s pick this week . Juicy and sweet at the peak of the season. A great use for sweet cherries is a cherry and pinot noir sauce. It is good on lamb,pork, salmon, duck , quail, beef and chicken. 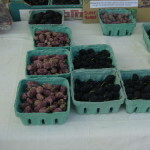 Everything is at the market including the pinot noir. Navarro Vineyards sells their award winning wines at the Saturday market. They also have wonderful juices. For cherry sauce, heat oil in a sauce pan over medium heat. Add shallots and cook for about 4 minutes or until soft. Add remaining ingredients and increase heat. 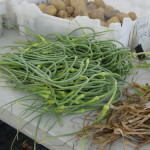 Bring to a boil then reduce heat and simmer for 10-15 minutes until desired consistency. Music is HUBBUB in the food court and roaming the market! 2UP Yoga Sample classes between 10am and noon 2UP is our new neighbor at Luther Burbank Center for the Arts. Right now it has to be the red and the yellow cherries! So juicy and tasty. They have a short season. 10 ways to save some cherry goodness. 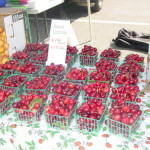 Ponce/EGB Farms and Busalacchi have cherries. 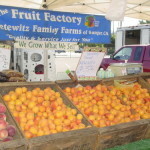 It’s a great start to the stone fruit season; EGB/Ponce Farms and the Fruit Factory are at the Wednesday market. The Wednesday market welcomes two new vendors : Italian Ice and the Hummus Guy. This week our neighbor at Luther Burbank Center for the Arts, 2 UP Yoga will be giving informal demonstrations from 10:30 through Noon. 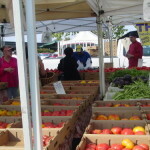 The Saturday market is bursting with fruit and vegetables. 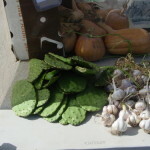 Spring produce is still around but summer is on the way in. 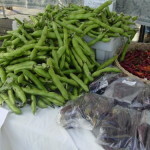 Fava beans are in …you can even find a few pounds already shelled. 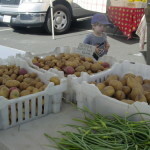 Besides all the great spring and summer produce at the market, this Saturday we have a very special young, performer. One of our market regulars is a yoyo wizard. He will be doing a special demonstration. 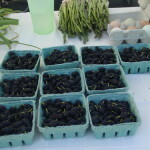 The Wednesday market is an omnivore’s delight. 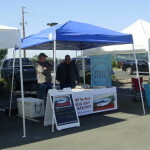 This week’s Wednesday market vendor list includes Pepper Ranch Poultry: chicken and eggs! Franco’s One World Sausage will be here too. Plus Dream Catcher Ranch and Fresh Off the Boat. 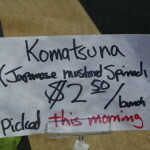 Wednesday is shaping up to be a great market, you already know fresh, local, king salamon… Local tomatoes, wonderful greens and lettuces, beautiful rose bouquets, Heritage Asian vegetables including Korean spinach does not stick to your teeth! Mother’s Day is on the horizon. Quillfully Yours has cards and small gifts. I’m Sew Sure has a wonderful array of nakins, table cloths and other beautifully sewn items. If your Mom’s a chocolate lover check out the selection at Wine Country Chocolates. 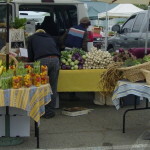 Stop and enjoy the day the best farm to table fare anywhere anytime he Green Grocer is cooking tomorrow. Wan something to grb and o — Mi Fiesta has hot tamales – the best fast food.